This exquisite painting depicts Goddess Saraswati with Lord Ganesh and his Consorts on a terrace. The new masterpiece is painted with great skill and the highest finishing. The fine art print captures the finest details and vibrant colors. The two gods of wisdom, Saraswati and Ganesh are seated facing each other. Saraswati is the Goddess of learning, knowledge, and wisdom - worshiped especially by students, teachers and scholars. She is carrying a white lotus symbolizing supreme knowledge and a musical instrument representing all arts while seated on her vehicle, the swan. Ganesh, the cherished elephant-headed god of wisdom and intellect, is seated on a throne, wearing a crown and shielded by a golden parasol, a symbol of royalty. Ganesh represents the Supreme Being that removes obstacles and ensures success in all human endeavors. All auspicious events in Hinduism begin with the worship of Ganesh. Colorfully dressed consorts of Ganesh who personify Siddhi (spiritual power) and Riddhi (prosperity) surround the deity. A tray of food is near the Lord. The vehicle of Ganesh, the mouse, is sitting near the feet of Ganesh indicating one who has conquered his ego. 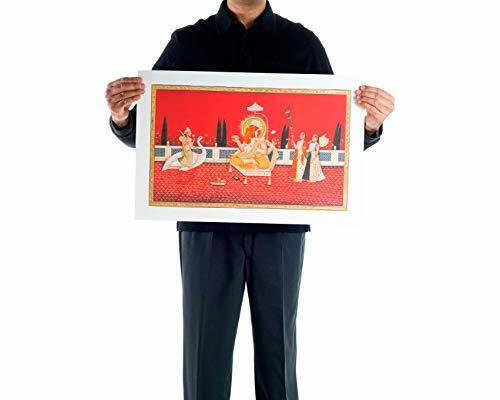 This is a highest quality Giclée fine art print of a traditional Indian painting, expertly printed and color proofed on fine art paper. It is printed on St Cuthberts Mill heavyweight 100% acid-free cotton rag paper using Epson 11-color UltraChrome HDR archival pigment inks. St Cuthberts Mill state "The paper will last for hundreds of years (in good storage conditions) and won't discolor or fall apart". A signed certificate of authenticity accompanies this Limited Edition print. To ensure damage free delivery, we ship in heavy-duty cardboard mailing tube. Paper Size (with border) Height 41cmx Width 64cm. Image size Height 33.3cm x Width 56cm. Printed on larger paper with a border between 2cm to 5cm to allow ample border for matting and framing.